Premium Services in Curriculum support, Health and Wellness, Consulting and Professional Development! With many years of experience working in school systems, in general education settings within community, in Mental Health and Addictions, with the Alberta Teacher's Association, working on several boards and her work on a wide variety of government initiatives to draw from, Buffalo Woman offers her services to you! Buffalo Woman Enterprises provides numerous workshops and will develop workshops and presentations specific to your needs. Just request a topic and BWE staff will work with you to fulfill that need. Buffalo Woman - Deborah Lloyd is a singer and plays guitar and hand drum to bring in elements of music to storytelling. Students are modeled and taught the art of storytelling using books and the aural tradition to build skills in storytelling. Students will learn the responsibilities of story telling and how to develop a trust in listeners and being a great storyteller! There's a storyteller in all of us! The work of the Truth and Reconciliation Commission will come to light in these workshops and you will understand some of the history around the residential school experience. This experience will bring light to the inter-generational affects of residential school experiences. This workshop provides service providers with tools to instill hope in our youth. The "Hope Bag" concept allows youth to devise their own tools to self diagnose and enrich their own lives based on the traditional medicine bag concept it allows youth to furnish their bag traditional and personal items so they can connect to their own world and ground themselves and to demonstrate how to develop hopeful relationships with those around the! By putting these tools into their bag for future use in times of discontent youth can recall better times and good connections with people who love them and whom they love to help them heal the hurts. This tool can assist in suicide prevention initiatives within your agency or school. BWE will come in to your school and deliver the workshop to youth or after you have had the training you can work with your youth group. BWE provides INDIGENOUS perspectives to assist you in teaching and developing your curriculum and practice! Primary , secondary and tertiary resources are provided with experiences, speakers, crafts and displays to enhance your experience! You can choose one or more of BWE's options to meet the needs of students and teachers alike. For professional development in any sector you will be provided with excellent development in Native culture. See product page for Sale of Craft Kits! Buffalo Woman Traditional Women's Dancer at History in the Hills 2012 Powwow in the Cypress Hills Interprovincial Park at Elkwater, Alberta! for more information on History in the Hills visit the link below. BWE provides problem solving and conflict resolution through mediation in talking and healing circles. These services can be provide through sessions or through retreats in a traditional camp setting. Welcome to Buffalo Woman Enterprises, Consulting and Education Services! Deborah Lloyd is a Cree woman of distinction. Her traditional name is Buffalo Woman (Puskwa Mostos Iskwew in her Cree Language). Deborah has been teaching and consulting for many years in k-12 public school systems. She was awarded the distinguished Esquao award for Contributions to Education in Alberta in 2010, was appointed a Harris Fellow by the Rotary Foundation of Rotary International and has won several community awards in her field! 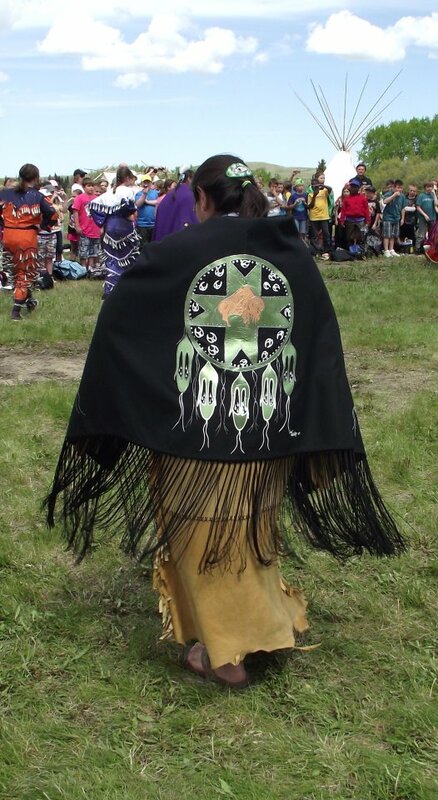 She worked many years on the Alberta Teacher's Association Instructor's Core teaching Alberta teachers in First Nation's, Metis and Inuit education. Buffalo Woman provides premium services as a primary resource in delivery of this specific curriculum. She has developed programs at every educational level. She has provided professional development for many professionals in teaching, post secondary education, various levels of government and children's services personnel. She has developed traditional methodologies in the teaching process to enhance educational experiences for young and old. Her company, BWE collaborates with and employs traditional elders to assist her in ensuring needs are met in a culture specific way. She focuses on employing Aboriginal youth and Aboriginal peoples with disabilities. Consulting Services - BWE can assist your agency or school in increasing and enhancing services that you currently offer. BWE can assist in evaluation of your programs and services, providing feedback and assistance in acquiring agency accreditation, development of funding proposals or increasing accountability in your service. BWE can help you better serve your First Nations, Inuit and Metis client base and all people that you serve! Through traditional storytelling, song, dance and hands on experience Buffalo Woman will immerse you in Native Culture. Buffalo Woman will visit your class room, place of business or provide you with a traditional classroom and setting. BWE specializes in providing opportunities to develop cultural competencies! BWE provides professional development sessions lecture style or workshop format. Deborah is now Certified by KAIROS to deliver the Blanket Exercise to all Canadians. Utilizing the Medicine Wheel philosophies Buffalo Woman accesses traditional elders and teachings to address contemporary problems and issues to come up with balanced solutions. It is the prime goal of BWE to educate and empower all people to understand and explore Native Cultural practices to seek balance in their lives. BWE provides Aboriginal Awareness Training that will provide 8 and 16 hour AAT Certificated sessions for social workers and agency staff. Next session will begin in the Summer of 2019!! BWE can provide your staff and agency staff with any other professional development upon request. Retreats will be provided on a registration fee basis. School program will be charged on a per participant basis ranging $15-25 per participant depending on programs and number of participants. Please email buffalowomanmh@gmail.com or call 403-866-2991 for further details. Schools must cover all busing costs. PLEASE NOTE: WORKSHOPS WILL REQUIRE DISPLAY SPACE, ROOM FOR TALKING CIRCLES, CRAFTING AND DANCING MORE THAN ONE SPACE WOULD BE OPTIMAL OR A LARGE FLEXIBLE SPACE WOULD WORK WELL!! Buffalo Woman Enterprises will negotiate to work within your budget! Please look at funding applications through Alberta Foundation for the Arts for special programming. BWE will help you design a multi-day program to work in several divisions and develop an immersion program for you across grades!